Watercolour pastel on paper, 2007. 2008 re-edit. For the 300th image (wow, 300!) I thought I’d share a re-edited version of one of my more popular paintings. For some reason, this image has sparked a lot of positive feedback. It’s an imagined depiction of the journey of Mary and Jospeh to Bethlehem, as found in the Bible book of Luke. I’m starting to feel Christmassy already, so here’s my early entry into the Christmas spirit! 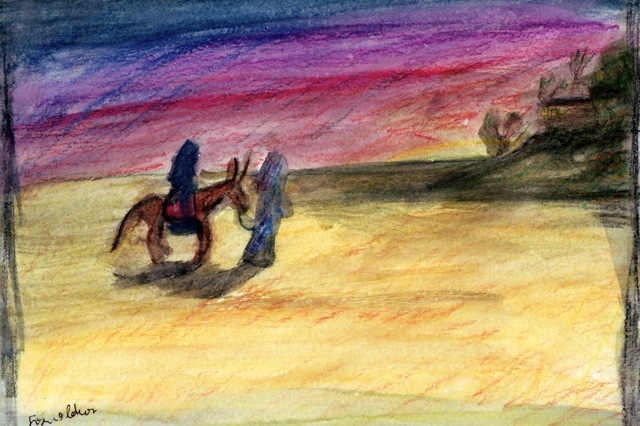 Can be seen in larger form at: http://flokot.redbubble.com/sets/31396/works/1972033-2-journey-to-bethlehem.